Nominations are still open, and should be submitted by 8th April, after which manifestos will be shared and campaigning begins. The vote will be a postal ballot (another one, sorry!) between the 29th Apr-23 May. View further info and updates. 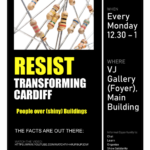 This entry was posted in General News and tagged General Secretary Election, News Roundup 28 March 2019 on 28 March 2019 by the Cardiff UCU web team.